- Alternate meat, onions, mushrooms, and the remaining vegetables on 8 (14-inch) skewers, place skewers in shallow dish. - Combine 1/2 cup Red Chile Sauce and wine. Pour over kabobs, turning to coat. Cover and refrigerate 4 hours. 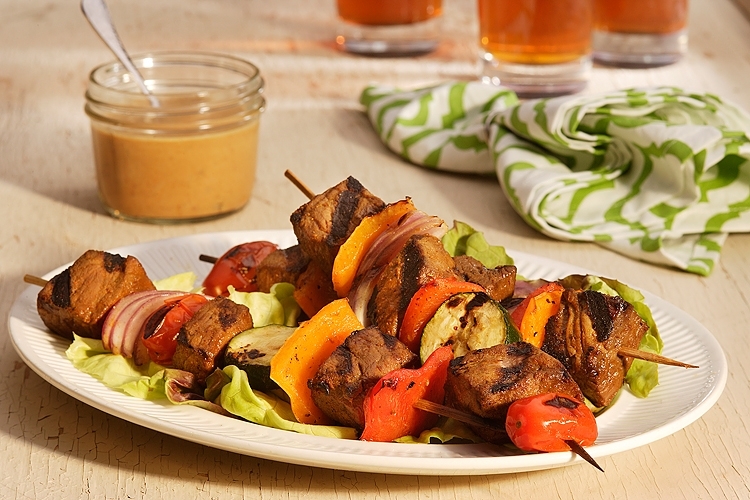 - Remove kabobs from marinade, discarding marinade. Place kabobs on a rack; place rack in boiler pan. - Broil 5 1/2 inches from heat (with electric oven door partially opened) 8 to 10 minutes, turning occasionally. - Combine sour cream and remaining 1/2 cup Red Chile Sauce. Serve with kabobs. Note: The Red Chile Sauce and sour cream mixture makes a spicy dip for raw vegetables or baked tortilla chips. Use a few spoonfuls of this sauce to spice up salsa. Spanish rice, gazpacho, tacos, refried beans, or vegetable soup. - Remove pepper stems and seeds. (Wear rubber gloves when handling peppers.) Cover peppers with boiling water; let stand 30 minutes. Drain, reserving 1 cup liquid. - Position knife blade in food processor bowl; add peppers and reserved liquid. Process until smooth, stopping twice to scrape down sides. Set aside. - Cook garlic in oil in a heavy saucepan until tender. Gradually stir in flour, and cook over medium heat, stirring constantly, until caramel colored (about 6 minutes). Gradually add 2 cups water, stirring constantly. Stir in pepper mixture, and cook until slightly thickened. - Pour mixture through a wire-mesh strainer into a bowl, discarding solids. Return to saucepan; add cumin and salt, and cook over medium heat until thickened. Sauce may be refrigerated up to 3 days or frozen up to 3 months.